Making good use of that new garage I see. Nice work. I don't know which I want to see more of. The car, or the garage. There both amazing! BicknellWelding wrote: I don't know which I want to see more of. The car, or the garage. There both amazing! I think the backyard is more of a money pit than a tree. You can always shoot semi gloss black over the flat if' you don't like it. I still haven't made up my mind but also going to try a flat. Post up some pics when you 're done...I'd like to see. That firewall will look good no matter what color you paint it. But not making it the standout feature (which should be your motor) is even better. The flat should be great, but obviously Im partial to it. I'm no body man, that's for sure. I am so tired of sanding I can't see straight. I just want it painted so I can start bolting stuff back together. 5 hours of sanding doesn't look like I've done anything. 5 hours of bolting stuff back together looks amazing! Primered and wet-sanded with 600. Wet-sanded the frame as well. Not that you'll ever see it, but why not... Taped and ready for paint. Why not, is right! Bet you shot primer in the inside of the frame too. Might as well. 77mali wrote: Why not, is right! Bet you shot primer in the inside of the frame too. Might as well. I did. Wasn't too worried about it though. The entire car was sprayed with Ziebart when it was new and it was all still there. Given how hard it was to remove from the outside of the frame, I'm pretty sure I don't have much to worry about. Ugly or not, that stuff flat out worked. 38 year old car with no rust is a pretty sweet deal. That looks really great. 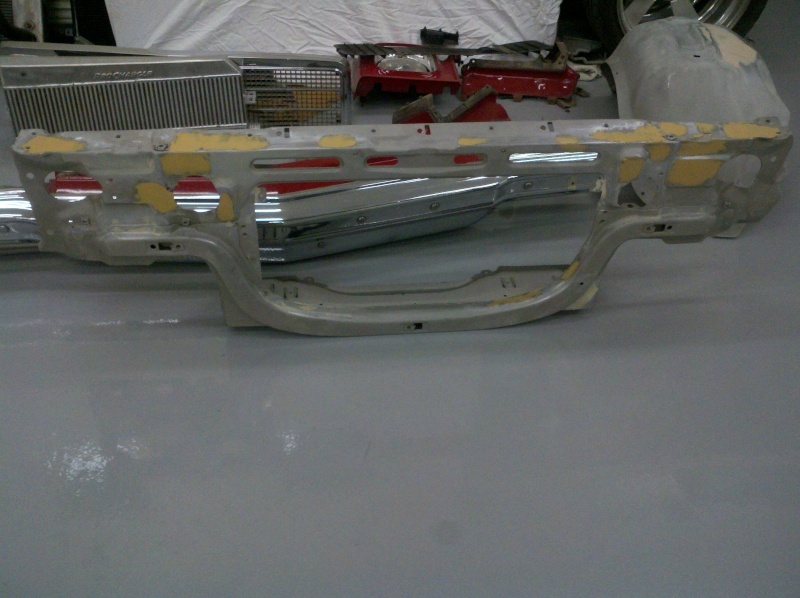 When I did my '74 Malibu, I sand blasted the area that you have painted. I went with black paint on mine. Always nice to work on a clean engine compartment. I don't know, with all the nice work you put into that firewall, I'd be tempted to paint it body color and black out the frame. I am running the factory wiper setup, but have omitted the washer tank. I agree, they are hideous. I couldn't decide what to do, so I completely sanded it down to metal, and shot it with the same paint. I'll take a photo tonight.